While I wait for my M56 breastplate and headset, I'm focusing on another project. I got my first Pulse Rifle, a “Spulse” from Spat in 2010. It arrived with less than two weeks to the next 'con and I did a rush job on assembly and painting. Having rushed the job, it had some horrible parting lines and I wasn't happy with the paint. I did a repaint on it and it looked better, but when I got my Snow Wolf and observed how some of the parts fit together, I found myself wanting to do another repaint. In addition to that, I recently acquired a Snow Wolf grenade launcher, and also had a proper vent and triangle sitting in the parts bin. I've got the time, and the parts, so it's time for the Spulse to get some rehab and restoration. The first challenge is taking it apart. I didn't assemble it with the intention of ever disassembling it. I used a hammer and chisel to carefully separate the pieces, but it wasn't without cost. The gun is glued together with gap-filling cement and in some places I also added screws. You can see a couple of places where I cracked the model while separating the pieces. My next step will be to remove as much of the old glue as I can and get a better fit between the pieces. I'm also going to tackle that parting line. Because these two halves are fused together with glue and screws, I may have to re-sculpt some of the joints with putty. We'll see how this goes. Once I have the main body together, I'll be trimming the vent and Snow Wolf launcher to fit. The Snow Wolf and Spulse have slight differences in scale which will need to be considered. For comparison, here is my Spulse (top) and Snow Wolf (bottom) together. You can see the scale differences, which will be a small challenge when installing the Snow Wolf launcher on the Spulse. FWIW, I'm pretty sure the Spulse is closer to screen accuracy in size. Once everything is fitted and re-assembled, I'm going to repaint and weather it. Hopefully I can have it ready for Marscon, which is just about a month away. Last edited by Erik_MAA on Sun Nov 25, 2018 9:09 pm, edited 2 times in total. It shows how much fun you can have with building/upgrading the Spulse rifle. So this project wound up morphing into the M41C build, but I've got another Spulse on the workbench I am messing with. 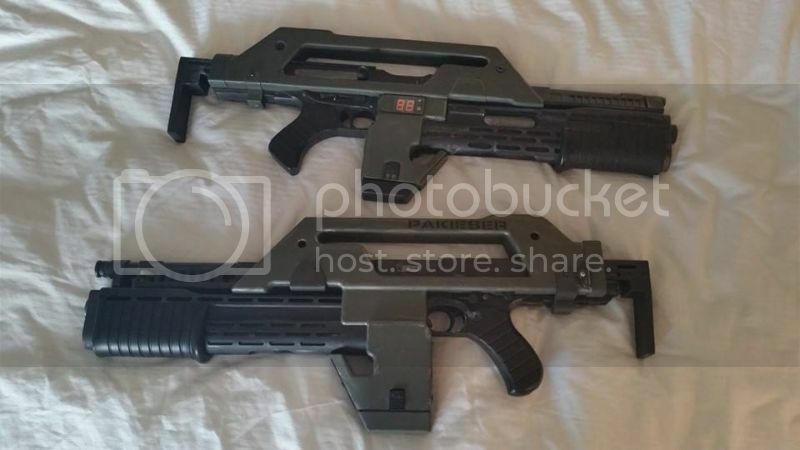 The new Spulse is on the top, the bottom gun was rebuilt into the M41C. I'm moving my workspace indoors for the Winter (gotta love Minnesota) but I'm hoping to get this one done by Marscon. Still gathering parts for my Hero build too! - Wear a respirator while sanding and immediately clean as you go with a shop vac. 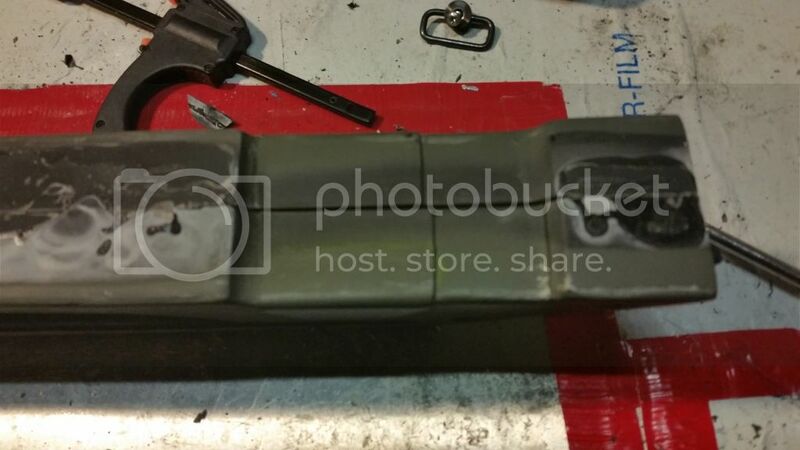 - Bondo spot putty is one of the best things ever. I don't know where it's been all my life. - Kydex and styrene are awesome for patching and scratchbuilding. Easily cut, heat formed, sanded and takes paint well. - Instead of obsessing over perfect straight line cuts, rough cut plastic with a scissors and use a belt sander to true it up. Works great! - To fill gaps, glue small pieces of styrene in first, then putty. You use less putty and it sands/paints better. - For large areas that need to be puttied, use plumber's epoxy. It dries rock hard and can be sanded and painted. - For final sanding, always wet sand. Makes a huge difference! - Prior to painting, blow dust off the surface with an air hose and then rub down with a tack rag. so you used styrofoam and then overlaid bond on top of that for the sealing coat before sanding and then painting? Not Styrofoam - styrene. As in polystyrene plastic. This thing is so cool, I almost feel bad about chopping it up....almost. Had the same feelings, soon went away when it was dropped into the SPAS cage though! I've also got an extra Thompson and a SPAS cage so I'll likely build a 6th gun at some point. I've also got a TRamp and Majenko sound board I need to figure out what I am going to do with, and I'm waiting on two 10-hole vents from Matsuo for the Snow Wolfs. This is getting pretty crazy. Unseasonably nice weather has allowed me to get out into the garage and work on my Spulse and my Hero. Spulse shroud is almost done. I have to modify the magazine well extensively to fit the width of the Snow Wolf grenade launcher. I also added some more detailed selector switches to the Thompson part. Turning my attention to the Hero, the shrouds need some work (I knew this when I bought it). The left side is warped and cracked in a couple of places. Some judicious work with a heat gun sorted that out, and I reinforced the inside with some styrene to make it stronger. Hairline cracks have been filled with gap filler cement and bondo. 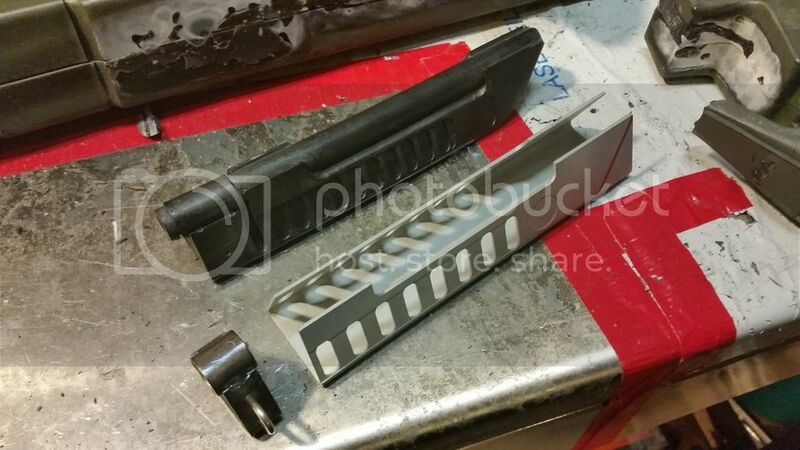 Added some additional styrene to the magazine well of the Spulse to recapture some of the details. After that dries, I'll trim it to fit and putty the seams. The Hero gun is coming together. I test-fitted the shroud on the resin Thompson and everything seems to fit nicely now that I've straightened the warp out. There's enough parts in that box to build yet another PR, if I can find a set of shrouds and another counter. I have a leftover resin grenade launcher from the Spulse (the Spulse is getting a Matrix launcher) and I want to do something with it, so I came up with this "stand-alone" concept. It will take a bit of work to finish, but I think it will come out pretty cool. Cool stuff. The hero shrouds look fantastic now. Sorta makes me wish I hadn't sold off all my extra parts...and extra pulse. I guess I should worry about fixing my main pulse before getting too nostalgic for building new ones though. My Hero PR has a resin Thompson reciever with working bolt, recoil spring and recoil spring guide. I drilled and tapped holes for two stock retaining bolts in the top of the resin reciever. Because the bolts don't intrude into the reciever the Thompson bolt and recoil spring move freely. I can extend the stock, but I can't lock it into place. Any suggestions for a locking mechanism that won't interfere with the operation of the bolt? Weather hitting the high 30s through Monday - hoping to make some progress and maybe even finish one! Best of luck Erik! Looking good! It was a scorching 38F today so I got back into the garage to work on a few things. I've got a drop coming up in March and I've got a few non-USCM props I was also working on. I'm test fitting all the Hero parts tonight, and the Spulse looks like it's good to go. If the Hero test fit goes well, I am going to see about priming and painting this week. For a while I've been working on a realistic racking bolt for my Matrix PRs. I did a proof of concept quite a while ago, but tonight, with better tools, I was able to build a decent dummy bolt. 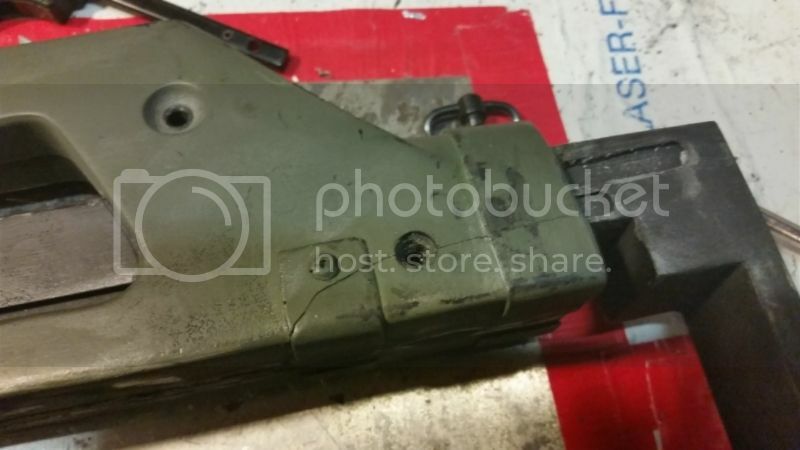 Here you can see the Matrix ejection port. I used a drill and Dremel to remove the blocked portion and open it up like the real thing. Comparison of a resin cast of a real-steel bolt to my wood and metal dummy bolt. 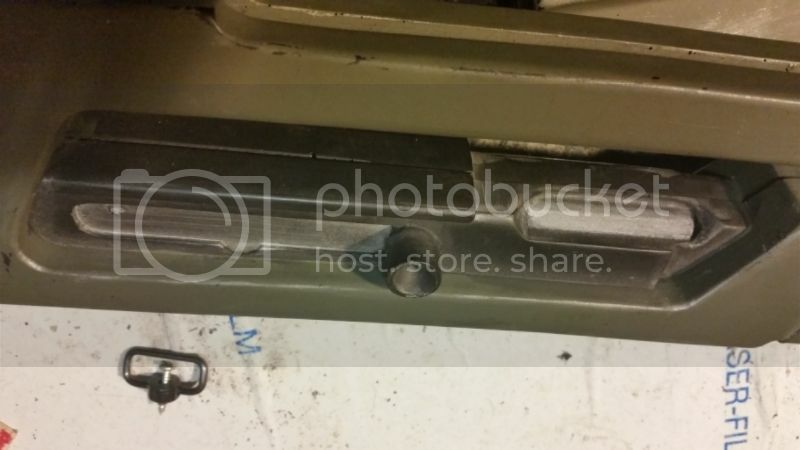 While you will be able to rack it, my bolt won't be trigger actuated to it's a pretty simple design. There is a hole drilled in the front for the bolt extension (in this case a piece of pipe) and in the back for a recoil spring. For the actuator, I am going to bond the flat "bolt" assembly that the gun comes with to the side of the wood block. Last edited by Erik_MAA on Thu Feb 14, 2019 9:31 pm, edited 1 time in total. More progress on the working bolt mod for the Snow Wolf/Matrix. 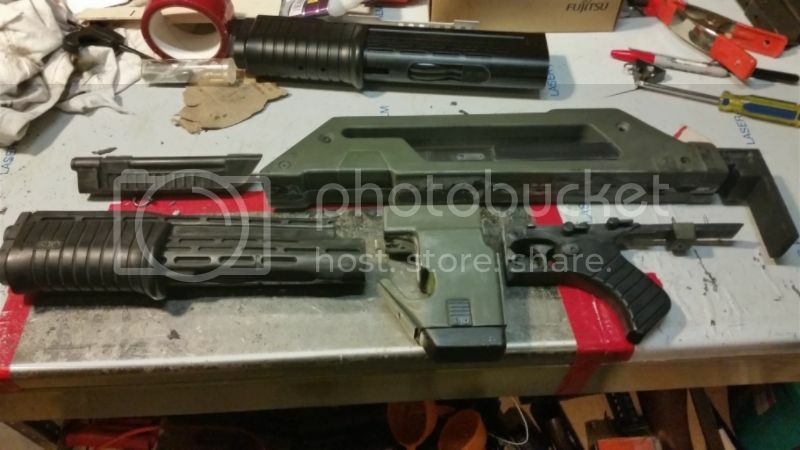 This is a permanent modification that renders the gun unable to function as Airsoft. To start this mod, you have to tear down the mechbox to just the frame - you will only be using the trigger and frame, everything else can go. You then need to cut the top off the mechbox to create space in the upper receiver. You also need to remove the hopup. Here we have the unmodified gun. The hopup unit takes up half the ejection port, and the other half is blocked by a facade of a bolt. Removing the hopup and opening up the ejection port gives us this. I used a drill and Dremel for this, working very slowly, and finished it with a file. One my first attempt I took off a little too much and had to build it back up with plumber's epoxy. I made a bolt out of scrap wood and aluminum tubing. To make the actuator functional, I bent the fake bolt 90 degrees in the front and back so the wooden block fits inside it. 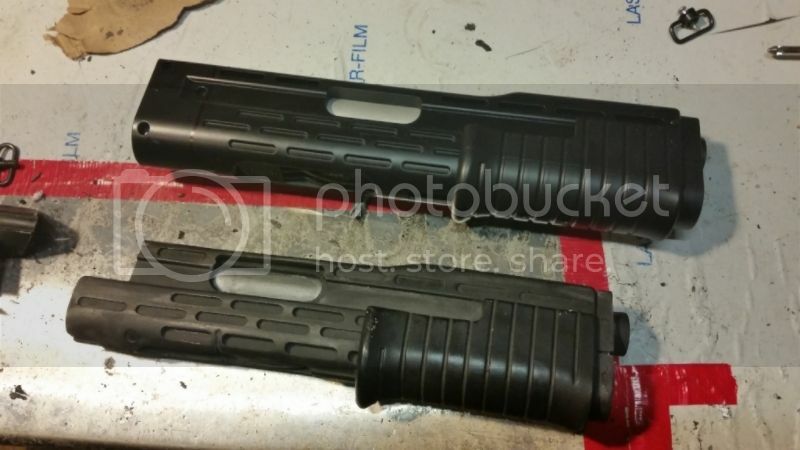 Inside the upper receiver is a groove for the fake bolt. I cut a notch in the front and back to clear it. Inside of the Thompson upper, showing a few things I removed so the bolt can travel back and forth. Last edited by Erik_MAA on Thu Feb 14, 2019 9:30 pm, edited 2 times in total. Here you can see how the fake bolt fits onto the wooden block. Looking down into the upper, showing how it all fits together. I haven't added a recoil spring yet, still engineering that part. You can also see a thin piece of styrene I used as a shim to align the bolt so it closes properly. Bolt in the forward (closed) position. Last edited by Erik_MAA on Thu Feb 14, 2019 9:23 pm, edited 1 time in total. How much does it cost to build one or order one?